Scrum is all about communication, and transparency and daily stand-ups help a lot in maintaining this for the team. Through this blog, we will learn the art of standing and talking. Openness, transparency, and the enthusiasm for communication are some of the most important elements to Scrum in Agile. These factors support everything a team does in their daily work using Scrum practices; these are the reasons why teams are not afraid to respond to the changes as they know that feedback is important and everyone should be on the same page; this means what are they doing, what they did the day before, and if there are any issues/concerns. 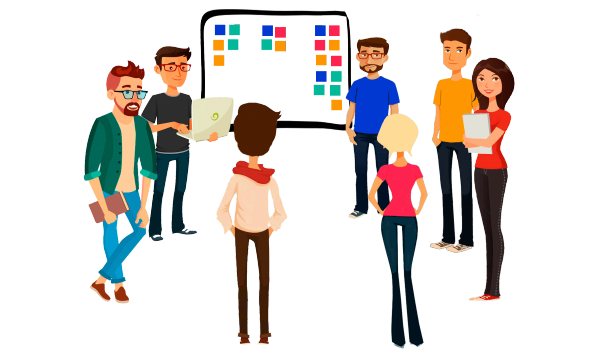 Daily Scrum is the key to inspect and adapt meetings which is a time-boxed event for the Development team to synchronize activities and create a plan for the next 24 hours. The Daily Scrum is held at the same time and place each day to reduce complexity. What did I do yesterday that helped the team meet the sprint goal? What will I do today to help the team meet the sprint goal? Do I see any impediment that prevents me or the team from meeting the sprint goal? The reason why they are called Stand-ups, is because we do not want this meeting to be stretched, not more than 15-20 minutes per day, so the Scrum Master makes sure that this ceremony doesn’t last longer than that. The team uses the daily scrum to inspect progress towards the sprint goal and to inspect how progress is tending towards completing the work in the Sprint Backlog. I think everyone must have listened this term “Fail Fast” while working on an Agile framework, well it is more like “Learn Fast” and communication is key to achieve this. So to summarize the values that makes a Scrum team successful, they are Focus, Openness, Respect, Courage, and Commitment, and if implemented with proper communication it can lead to a super successful team as well project.